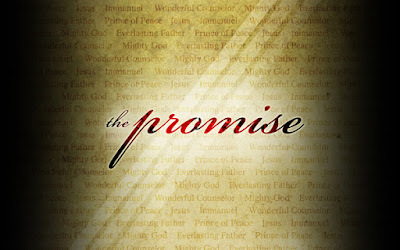 In considering a Christmas theme for 2011, I eventually focused in on that word above, “promise.” As I draw near to the close of 2 years with time in Scripture daily, I realize I’ve been immersed in this concept throughout the entirety of the Bible. I also realize these are promises which, though amazing, are far beyond wishful fantasy. We make promises all the time. Some we keep, some we forget, and some we outright break. But when God makes a promise, it will happen. And throughout the Bible, God continually makes promises to His people. Through covenants and prophets, recorded in songs and historical texts, promises just keep being made. When a baby is born, parents, relatives and friends often speak of all the promise contained in this tiny, new human who is a clean slate full of prospects. What will he do? What will she accomplish? This was a child born to grow into a man who lived like no other man had, perfectly, and who could therefore die to do what no other man could. He died to fulfill the promise of God to renew His relationship with His people who, like the first two, now refuse to listen to God and trust Him. Then, to fulfill those promises completely, He returned from the dead and, for now, to Heaven. Perhaps He’s even directing His patience toward you. If you never have, or need encouragement to do so again, start listening to God in His Word, the Bible. Trust Him and believe His promises. For you who do believe Him, thank God for all He has given and will give His people. Remember where the promises of God are found and fulfilled, through Him who was once a baby and who remains the ultimate Promise. Praying for you a Christmas & New Year full of Promise.